Today we celebrate the Fourth Sunday of Advent. Waiting for Christmas is a special joy. This Advent we have been called and challenged to make room for Emmanuel. I hope that you have succeeded in making room in your hearts, minds and lives for the Lord. “Today a light will shine upon us, for the Lord is born for us; and he will be called Wondrous God, Prince of Peace, and Father of future ages: and his reign will be without end.” (Is. 9:1, 5 and Lk. 1:33) With these words the Liturgy announces the birth of our Lord Jesus Christ on Christmas Day. It is truly a joyous day in which we join Christians all over the world in welcoming into our hearts the King and Ruler of all creation born of the Blessed Mother. I hope this Christmas finds you and your family in good health and happy. As we celebrate the birth of Christ this Christmas, let joy be born in our hearts not just this Christmas day but every day. Hopefully our world, that can seem so lost in darkness, will experience the light of Christ in the light of our joy. During this season we welcome family and friends. We welcome strangers and travelers in our midst who may join us to celebrate the Eucharist. Offer welcome, a smile, and gracious hospitality. If you are returning to Church today from a long absence, or even a short one, let the Joy of this celebration fill you and know you are welcome at Our Mother of Perpetual Help. Know that all are welcome in this place. It has been almost 7 years since I received my assignment to be pastor of the Our Lady of Fatima and St. James Cluster. On January 1 we will celebrate the 5th Anniversary of Our Mother of Perpetual Help Parish. The road has not been easy as we try to find our way together. Some people are not happy, others have moved on. My wish is that we put aside our own agendas and come together as One Community of Faith. There is no Our Lady of Fatima. There is no St. James. There is Our Mother of Perpetual Help Parish. I am happy to walk with you. I am grateful for your prayers and support. May God bless you this Christmas. May your hearts be filled with the Joy of Christ’s birth and may you be missionaries of that joy. On Wednesday, February 28th we had a morning of reflection staff retreat. We had time for prayer, reflection, and some private time. I recalled that on March 1, 1972, forty six year ago at 31 years old, I came to Our Lady of Fatima. A lot has changed, some for better, some not so good. But as I approach my 79th year, I find myself more reflective and very grateful. Two things really struck me that week. On Monday (Feb. 26) and Wednesday (Feb. 28) the Gospels really grabbed my attention. On that Monday, in Luke’s gospel, Jesus calls his disciples to “Be merciful, non-judgmental. Don’t condemn and forgive.” On that Wednesday, in Matthew’s gospel, Jesus projects that greatness is measured by service and outreach. Now I probably have read and been exposed to these scriptures as much as most of you but somehow the challenge has really grabbed my attention and tied into our Lenten theme—Come Back To Me. What a life changing call for forgiveness and humble service. Since 2012 Our Lady of Fatima and St. James have been connected. Together we have become Our Mother of Perpetual Help. I am really proud of our parish and its accomplishments. The beautiful carefully planned liturgies and music, the friendliness, warmth and openness of our people, the generous giving spirit are a special source of strength. As a parishioner of Our Mother of Perpetual Help, I feel privileged and grateful that our paths have crossed and that we continue to evolve and grow together. I thank God that I have been touched by so many wonderful committed people. By your love and compassion, you have made God’s love alive for me. For this I say Thank You. You are a blessing. It is truly a joy for me to continue to walk with you as we try in community to build the Kingdom of God. Last week we celebrated the Third Sunday of Advent, known as Gaudete Sunday which means “Rejoice”. Pope Francis has encouraged people to strive for joy telling us, “We’ve never heard of a sad Saint.” There is a special joy we experience waiting for Christmas. As we strive to become the light, in the midst of the darkness in the world, we should also strive as Pope Francis suggests, to make being missionaries of Joy part of our lifestyle. So, as we celebrate the birth of Jesus this Christmas, let joy be born in our hearts not just this Christmas day but our whole lives. During this season we welcome family and friends. We welcome strangers and travelers in our midst who may join us to celebrate the Eucharist. Offer welcome, a smile, and gracious hospitality to those like Mary and Joseph, who are seeking room in the inn. Let us not turn them away to be born in a manger like the baby Jesus. Know that all are welcome in this place. If you are returning to Church today from a long absence, or even a short one, let the Joy of this celebration fill you. Let the light of Christ into your lives and into your hearts. My thanks to all of you who have been faithful and faith-filled parishioners, for all you do even through the tough times. It is with humble joy that I give thanks for the honor of serving as your pastor. Thank you for all your support and prayers. You are a gift and a blessing. May God bless you this Christmas, may all darkness in your lives be removed by the light of Christ. May your hearts be filled with the Joy of Christ’s birth and may you be missionaries of that joy, Amen. Wishing all of you Christ’s Joyful Peace and Love. We have begun our budget review for the next fiscal year which begins July 1, 2017. The process involves Vicki Mazurek (Director of Finance & Administration), the parish Finance Council, and myself, pulling together all of our expected operational expenses and income in the coming year, revising as appropriate to ensure that the parish is in at least a balanced condition, or at best with an operational surplus. Examples of operational income are regular donations, Christmas donations, CSA payments beyond the goal, and rental income. Examples of operational expenses are cost of utilities, regular maintenance costs paid to contractors, and parish labor costs. The budget must not show spending more on our operational expenses than we have operational income to pay for those expenses. We also have a parish savings account that is used for capital expenditures for major upgrades, major repairs, renovations, and other one-time actions. The Archdiocese of Detroit’s Finance Policies and Procedures do not allow funds from a parish savings account to be used to pay for operational expenses. For the current fiscal year, we expect to end with an operational surplus of $58,381, and a savings account balance of $1,172,123. * a ramp providing access to the St. James office from the parking lot for those with mobility limitations (wheelchairs, etc). Our operational expenses in 2017-18 fiscal year will be lower by $35,280 due to number of reductions such as no costs to maintain the St. James school and convent, as well as an agreement with the developers of the senior living facility that basic landscaping/mowing and snow removal on St. James property will be done at no cost to the parish. Our operational income will include $20,000 due to receiving 5.25% interest on our parish endowment funded by general savings and initial funds from sale of the St. James school and convent. Annual rental income of $120,000 from Crescent Academy will end on July 1, 2017 when Crescent Academy will consolidate its high school at one site. We have had a good relationship with Crescent Academy but understand their desire to consolidate into one charter high school. Sunday and Christmas donations from parishioners have dropped by $57,000 or 15%, due to a 7% drop in weekly donations, and 52% drop in Christmas donations compared to prior fiscal year. Although we will manage to have a small surplus this fiscal year, our 2017-18 fiscal year will be a challenge if this trend continues. Parishioners donations provide the vast majority of funds to pay our bills. These income streams are absolutely vital for the well-being of Our Mother of Perpetual Help. Sunday giving, Christmas giving and CSA funds over goal provide the bedrock for parish operational income. The mediation settlement monthly payments from Edison Learning end after December 2017, a reduction of $31,250 in 2017-18 fiscal year compared to our current fiscal year. Our CSA goal was increased for this coming year by $9,583 or 27% over last year as part of a new formula used by the Archdiocese. Parishes were placed in classes according to their Offertory plus Christmas income over the past 3 years. These classes were then given goals in keeping with their income, with the highest class having a CSA goal of 15.5% of its income. The others classes were assigned goals of 14.5%, 13%, 12%, 10.5%, and 9.5%. Our goal was 12% of our income or $45,453. The end result of the above good news and bad news is that we have a $35,312 operational deficit if we assume that (1) donations remain the same as our current fiscal year, and (2) the likelihood that we will be unsuccessful in finding a new tenant to replace Crescent Academy at the Fatima school for the 2017-18 fiscal year. We are actively marketing the Fatima school and hope to be successful but it will likely not occur until 2018-19 fiscal year. While these challenges are significant, we are relying on the generosity of our parishioners and hopeful that we will see an increase in parishioner donations. For example, if Sunday and Christmas donations increased by 12% over this year, we would have no operational deficit in the coming fiscal year and a balanced budget. But as good stewards of the parish, we must not rely solely on an increase in donations. We are searching for further reasonable reductions in our budget draft with labor cost reductions as the most likely area to consider. I will be actively involved in all of the above and will have final approval to ensure that we have a budget that is balanced, but much more importantly, will ensure we are a faith community that is active and financially sound going forward for years to come. Again, we will continue to be good stewards of our parish resources. If you have questions regarding our plans, please contact any member of the Finance Council, Vicki Mazurek, or myself. All can be reached through the parish office at (248) 545-2310. Blessings and a Happy and Joyous Easter! St. Paul reminds us that if Jesus has not risen our faith is in vain. The Easter mystery is the high point of our Church liturgical year. Jesus rose and brings us hope of rising with him. I am grateful to all of the people who made our Lenten Journey to our Joy in Easter as meaningful and prayerful as it was. I am so very proud of our liturgies and prayer services. They are moving, inclusive, and thoughtful as they bring us closer to Christ. Our environment team’s creativity and talent never ceases to amaze me. The simple, understated and prayerful Lenten environment and joy filled Easter environment are a beautiful thing to behold. The members of environment team are unsung heroes for their tireless energy which they continue to share with our parish. A special thank you to those of you who donated a flowering plant to enhance our worship environment. It is an important tradition that started long ago and am glad that we continue this as it brings a special connectedness to our environment. The gifts of our music ministers truly exemplify that when you sing your pray twice. The time that our lectors devote to preparing to share God’s word does not go unnoticed. 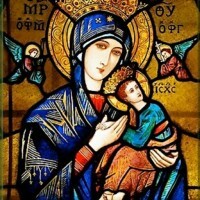 Today as we celebrate another Easter as Our Mother of Perpetual Help we rejoice together. Please keep our mission (Our Mother of Perpetual Help Parish is a welcoming and nurturing Catholic community building up the Body of Christ through prayer and service.) and our vision (Our vision is to be an extraordinary spiritual gathering place where people of all backgrounds and ages are welcome to question and learn, pray, worship, and serve. In community through prayer and worship we hope to continue to grow together in our understanding and appreciation of God’s love. We strive to change and improve our lives and the lives of others.) statements before you. They should be primary in all that we do together to build up the Body of Christ. Hopefully, we will continue to strive to come together with open and generous hearts. We are blessed. It was in the early 1980’s that I came to visit St. James. The Pastor at that time brought me into the church and indicated that a lot of maintenance was needed: church painted, pews painted, cushions acquired for the pews, and a general clean up and updating. It was an ambitious agenda but he considered it a very high priority. The improvements were notable. Now in 2016 there are several concerns that we needed and still need to address. Some are immediate, some are in process, some still on the back burner at our St. James worship location. Our Fatima worship location is currently in pretty good condition but there are always improvements and things to be done. The ongoing renewal, upgrading and preventative maintenance will enhance our premises. We want our worship locations to be the best they can be. The carpet in the church at Fatima is 35 years old and will be replaced. The cost of this endeavor is almost $25,000. The first major issue at St. James is the church roof. Our maintenance supervisor, Dave Bieniak, has solicited bids to fix the leaks and repairs have been made. The cost of these repairs was almost $17,000. The new carpet at St. James church has been installed and cost over $19,000. We have five double doors at the entrances of the church at St. James. All of which are in immediate need of refurbishing. Thanks to special generosity last year an effort was made to work on the doors closest to the parking lot. However, that effort did not work out too well.To save the doors and restore them appropriately will be costly but we are aggressively pursuing a remedy as they are a valuable and important asset. Hopefully, we will be able to protect them from some of the damage from the sun. Also, at St. James our need for a handicap accessible bathroom was a very high priority for us as well as the Archdiocese. Trying to accomplish this gracefully was important and the best placement was in the vestibule near Woodward. The old bathroom was upgraded. The cost of this project was over $17,000. The tile under the pews in the church at St. James was in very bad shape. It had not been waxed in many years. The front section has eight new coats of wax and is looking much better. The back section of the church was just done as well. The bi-annual volunteer clean-up effort at St. James has helped a lot but the time is here to do some upgrading. Another St. James project still in the planning stage is to make the offices handicap accessible. This will be an important and useful development. There are other items at our St. James worship location like renovating the flower room, renewing many of the brass vases and other brass appointments, repairing the organ to make it more reliable, repairing some of the concrete and steps. Slowly we are coming to grips with a number of needed repairs and renovations. Over the past four years – 2 years dealing with the clustering of our two parishes and the eventual merger of Our Lady of Fatima and St. James into Our Mother of Perpetual Help Parish on January 1, 2014 – a lot has developed. Sadly, the selling of the school and convent at St. James has been stalled through no fault on our part. We are hopeful that shortly the challenges involving this sale will be resolved. As pastor I am well aware of my responsibility to give leadership and direction to our parish. This is a responsibility that I take very seriously. I assure all of you that all decisions are made after consultation has taken place and a consensus reached. Staff and volunteers DO NOT make decisions on their own. We as Our Mother of Perpetual Help Parish can be very proud of all those who serve our parish. The staff and volunteers work together to realize our mission and vision statements and the goal always is the enrichment of our parish. In conclusion, I feel the need to offer a corrective. I know that not everyone is happy with all the things that have happened in the past four years. I am sensitive to that but over time I along with some staff and volunteers have received anonymous letters indicating indignation, sometimes misinformation, and sadly sometimes containing personal attacks and rebukes. Gossip, verbal abuse, or any anonymous letters are inappropriate, offensive, and simply not acceptable. I can assure you that they will be given absolutely no time, value, or weight. They will be immediately thrown into the trash. If you are unwilling or unable to identify yourself, we are not interested in your input. We will not put up with uncivil and uncharitable behavior toward our staff and volunteers. We all need to respect one another and to value the staff and volunteers who serve our parish. I can assure you that they work very hard for the betterment of Our Mother of Perpetual Help parish. We need to be respectful, cooperative, and grateful.